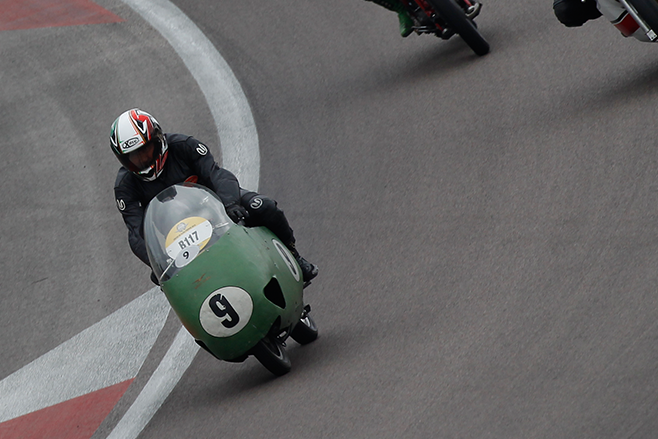 The V8 will feature in the Shannon’s Moto Guzzi Marquee and will be started and ridden on the road track at selected times during the Easter weekend event. It will be the only opportunity for Australian fans to see it in action during its time in the country. The V8 is owned by Giuseppe Todero, who is the son of designer and Giulio Carcano’s right hand man in the development and execution of the V8, Umberto Todero. Todero said he couldn’t wait to make the trek out to Australia. “I am so happy to be given this opportunity to come out to Australia with our friends and our special Moto Guzzis,” Todero said. “I’ve heard a lot about this country, its people, its Grand Prix riders and the ‘hoppers’. George Campbell, the brother of Australia’s first motorcycling world champion Keith Campbell, said he was overjoyed to see the machine his brother rode in action. “It’s bloody marvellous, I’ve seen the bikes when Keith brought out two bikes in 1956 but have forgotten what they looked like,” he said. The Moto Guzzi V8 has has a long and illustrious history, and is regarded in many circles as one of the greatest motorbikes of all time. In the mid-fifties, the competitiveness between the other racing motorcycle brands with the new four-cylinder engines in the 500cc class was becoming stronger and stronger. Despite recording fair results using a four-cylinder in-line engine in races, Moto Guzzi decided to take action in engine design – a decision that led to the best state-of-the-art racing motorcycle engine of that time. The 500cc engine eight-cylinder was conceived, designed and prototyped in the winter of 1954-55 and put on the test bench on Easter day of 1955. The engine proved to be powerful – maybe more than expected. The build assembly of the bike was very compact; the overall geometry was the same as the winning 350, but the total width and the front section was smaller. The crankshaft was an evolution from the solid type, to the pressed crank pins, and finally to the compound type with front splines on the sections for easy maintenance. No other parts have been modified other then carburetors which have been increased in Venturi diameter and the float number from two for all carbs to eight individual floats. 1956 was spent testing in races and in successful speed record-breaking efforts with Dikie Dale. Bill Lomas rode the bike for more than 1200km at full speed to demonstrate the solidity of the engine. 1957 was the first official racing season and started with the first victory at the first race with Giuseppe Colnago. Lomas got the speed record on a 10km standing start at 243km/h followed by the victory of Dale at Imola. Dale held a good lead in the TT and managed fourth place, but only because he was forced to take a break during the race due to fatigue and arm pump. During the season, Moto Guzzi hired Keith Campbell to replace their two official riders who were injured. Campbell began with some impressive results before Moto Guzzi unexpectedly declared, together with other Italian manufacturers, to end their time in road racing. The 500 V8 could no longer demonstrate its full potential and was confined to a dusty warehouse and forgotten for years. Three complete and running bikes still exist in private hands, plus three engines and other material, while two are in the Moto Guzzi Factory Museum at Mandello. The Moto Guzzi V8’s appearance in Australia at the 2016 Penrite Oil Broadford Bike Bonanza is a once-in-a-lifetime opportunity. It’s your chance to see and hear this legendary motorcycle in the flesh before it’s shipped back to its home in Italy.